New Zealanders now have good dental health by world wide standards. However that wasn’t always the case. In the 1950s New Zealand had one of the worst rates of dental decay in the western world. People as young as 21 routinely had to have their teeth extracted and just about all New Zealanders over the age of 40 remember the dreaded visits to the dental clinics. These were known as the “Murder House” where, as children, we were subjected to many fillings without any anaesthetic. Today things are very different for the vast majority of children in New Zealand. 50% of children have no dental decay at all and the average amount of decay (for the children that do have some decay) is around three or four fillings each. A very small minority have worse decay and even have to have teeth extracted. This is often caused by children given sweet drinks in a baby bottle. But contrary to what many people believe decay rates are very similar in fluoridated and non-fluoridated areas.The graph below was published in the Ministry of Health’s 2010 publication Our Oral Health. It represents the average decay rates of all five year old children collected from all the School Dental clinics. It shows that there is very little difference in decay rates between the fluoridated and non-fluoridated areas, and interestingly, it shows that decay rates in the fluoridated areas are increasing slightly whilst the decay rates in non-fluoridated areas are declining. The Ministry of Health claim fluoridation reduces dental decay by 40% but this figure is taken from a much smaller sample size which was used the 2009 oral health survey. No one knows exactly why dental health has improved over the years as there are many possible reasons. Better diet, refrigeration allowing for consumption of more fruit and vegetables, increased consumption of cheese, use of antibiotics or more tooth brushing all could of had an effect. Definitely a change in the diagnostic criteria by dental nurses in the 1970s led to a marked reduction in decay rates. Scientist Mark Diesendorf wrote an article called the Mystery of Declining Tooth Decay in 1986 which was published in the Journal Nature. 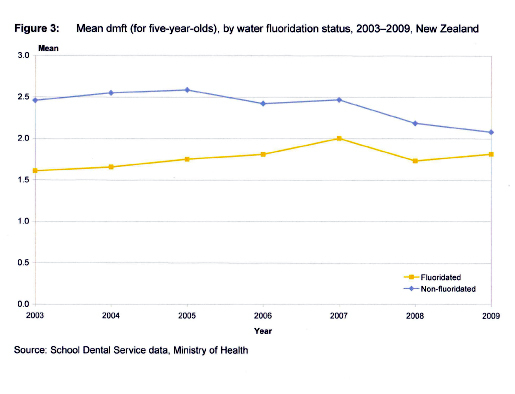 We do know, however, that reduction in dental decay was occurring in New Zealand before the introduction of fluoridation and that decay rates improved throughout New Zealand even though only around 50% of New Zealand is fluoridated. 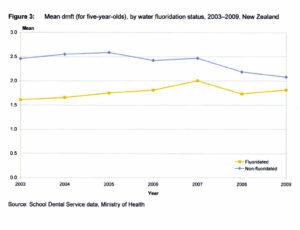 New Zealand now has about the same level of dental decay as most of the western world which is mostly not fluoridated.